Summary: Paul Fassa is dedicated to warning others about the current corruption of food and medicine. Read more from Paul: healthmaven.blogspot. com or naturalnews.com. The Internet and radio are increasingly advertising food packages that are meant to be stored for potential food shortages, which many are predicting. But there is a way to have your own food storage with less expense and even more nutrition. As a matter of fact, because of the higher nutritional value per calorie, sprouting should be started now to create inexpensive and tasty super foods for enhancing your general health. Sprouting is a do it yourself in-home activity. Almost all seeds and beans can be sprouted, offering a wide variety of quick and easy edibles. And by way of making those beans and seeds sprout, the nutritional value is greatly enhanced. 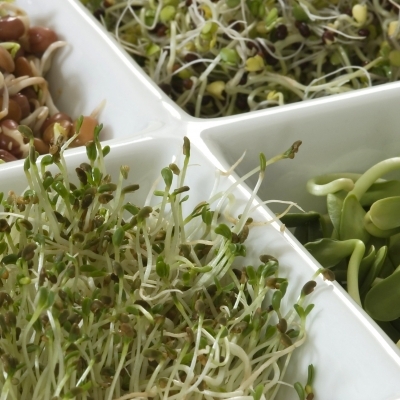 Sprouts can be eaten raw as salad, in salads, or in sandwiches and other foods. Among the easiest and most popular are mung beans, lentils, chick peas (garbanzo), black turtle beans, and alfalfa. 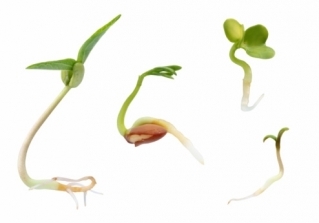 But just about any seeds or beans can be sprouted, and the techniques are basically the same. Only the pre-sprout soaking periods vary. Even grains—from rice to barley or wheat— can be sprouted to make breads that mimic the breads of old, before nutritionally devoid processing and bleaching grains came into vogue years ago with their high shelf-life dead breads. Even today’s whole grain breads cannot match sprouted grain breads nutritionally. There are basically two steps with sprouting. First soak for several hours or more, depending on the bean or seed type. Then set up a simple apparatus to allow sprouting, though some can be sprouted in a large jar. Average soaking and sprouting time is around a week or less. There are sprouting packages available on line or at health food stores. But know that sprouting is not difficult. Consider this: You can store an abundance of organic seeds and dry beans almost indefinitely, purchased inexpensively in bulk and stored without refrigeration. Then simply remove a portion at a time for sprouting. Sprouts can be refrigerated for several days. Think of sprouting as a mild form of indoor farming any time of the year, taking much less time and not requiring soil or sunshine. If you buy dry bulk beans, you have to first soak them and then cook them. And what happens with cooking? You lose nutrition and enzymes—up to 80%. Sprouting enables you to enjoy the beans or seeds in sprouted form without cooking. Not only are the nutrients intact, but they are also enhanced in the process! Minerals merge with proteins, increasing their function. Fats break down into essential fatty acids; starches are easily converted to simple sugars for rapid glucose metabolism; and the plant proteins break down into easily assimilated amino acids. And even more uniquely outstanding, sprouts are living foods that contain large amounts of biophotons (bio = life; photon = electromagnetic). Foods high in biophotons energize, prevent disease, and repair the body more than even fresh raw organic produce. • High storage capacity of inexpensive dry beans and seeds with long natural shelf lives. • Sprouting as needed requires little indoor space. • Sprouted seeds and beans will last in refrigerators for several days. • Sprouts can be eaten in a variety of tasty ways. • Sprouts offer more health value than other foods. So why not start now? Be healthier and ready to eat economically and well. Stay healthy if those lean times do indeed occur.